Twelve bright-eyed and bushy-tailed American twitchers and one South American twitcher descended upon Cunnamulla, chasing the elusive Grey Falcon. The birding group stayed a duration of three days from Monday the 10th until Thursday the 13th in search of the rare specimen. The Grey Falcon was no where to be found however, the list of other unique birds was still spectacular. These birds include: all three eagles and nests, Australian Kestrels, Black Falcon, Whistling Kite, Black Kites, Black Breasted Buzzard and the Australian Hobby. 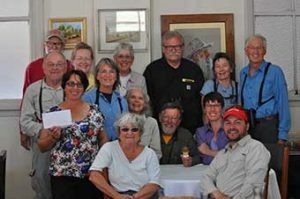 The group made a wise decision accommodating at the Club Boutique Hotel Cunnamulla as the local knowledge confirmed all the best birding sports, including the renowned Bowra Station. Tour Leader and Professional Bird Photographer Sergio Seipke said they were highly satisfied with their bird encounters in Cunnamulla. 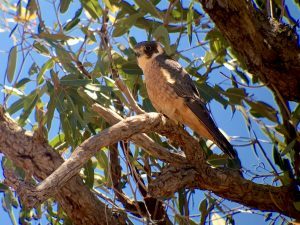 “Cunnamulla is a true gateway to the authentic outback for raptor watching and compared to anywhere I have travelled, Cunnamulla rates pretty darn good,” Mr. Seipke said. The group came from far and wide following their passion for birds. They came from four locations in Washington and one from Argentina. For one of the group leaders Bill however, it wasn’t his first trip to Cunnamulla. On their last night, the group experienced a classic outback campfire, where they were entertained by local school teacher, Reuben Birchley and accompanied by a selection of Australian songs that added to what was an already amazing stay. The group of twitchers presented a short speech before departing, explaining to hotel duo, Peieta and Carla Mills, that their venue was truly spectacular because of what they put in to it. They continued to mention that their stay at the Club Boutique Hotel Cunnamulla was a stand out across their many adventures and that they honestly felt right at home. The group also said they could see how the hotel values the community because of the numerous thanks you cards on the wall from various charity groups that received donations from the Club Boutique Hotel Cunnamulla. The group then presented Peieta with an envelope to pass on to a local charity or group of her choice. Managing Director of Out the Back Australia Peieta Mills said that despite Out the Back Australia Tours and Club Boutique Hotel Cunnamulla regularly hosting European tourists it was the first group of Americans. “It has been a demanding and exciting few days and both Carla and I are overjoyed with the positive feedback and appreciation for our efforts. We look forward to hosting them again next year,” Ms. Mills said. 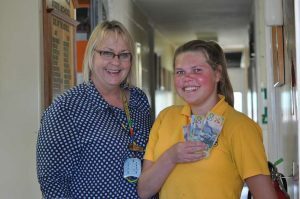 Principal Cunnamulla State School Karen Campbell and Performing Arts champion Tahni Thomas with cash from American twitchers. 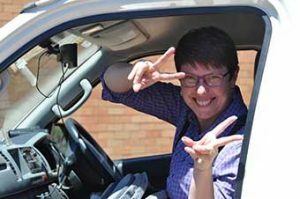 Cunnamulla State School principal Karen Campbell and Performing Arts team leader Tahni Thomas were ecstatic when Peieta Mills delivered the envelope of cash for the schools performing arts department. The performing arts program has been up and running for the past two years, coordinated by Rachel Biggs and run by Sydney based actor Peter Cook. The wonderful opportunity to get involved with the arts was pounced on by a number of students. Students that became the pride of Cunnamulla after taking out the overall prize at the Charleville Eisteddfod. Mrs. Campbell was over the moon with the donation. “It is with great thanks we accept the money and how wonderful is it that American twitchers would donate money to help us improve our town,” Ms Campbell said. For more information about the best Cunnamulla accommodation follow us on Facebook up to date information or join our newsletter!